Environmentally-friendly copper-free ablative uses Econea™ and zinc biocide for potent antifouling protection against barnacles, mussels, slime, and weeds. 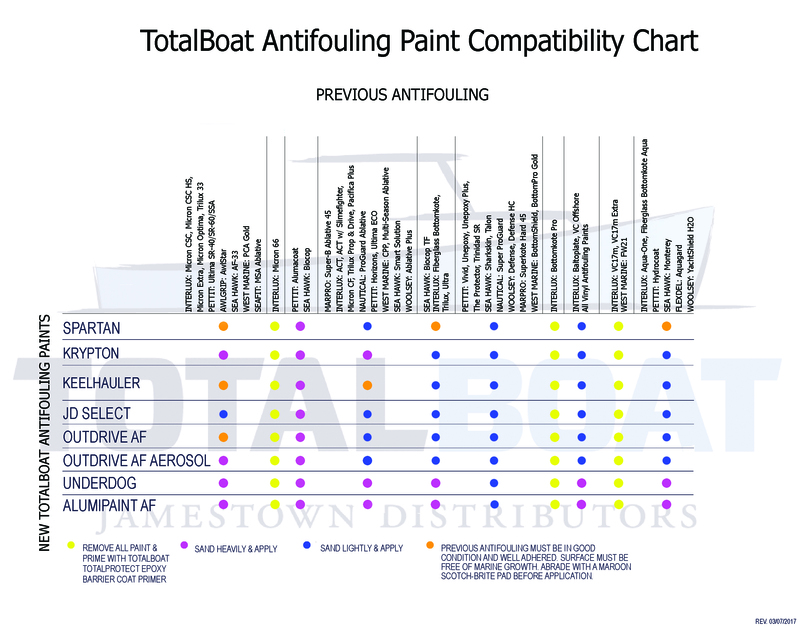 Use on aluminum, wood, or fiberglass boats in both fresh and salt water. Krypton is also ideal for outdrives, trim tabs, and other underwater metals. Krypton may be used on properly prepared aluminum hulls and underwater metals. Copper-free formula won’t contribute to galvanic corrosion. Available in bright colors not found in traditional copper-based bottom paints. Excellent color consistency and stability. Each gallon order includes a free roller & metal tray kit, paint suit, 1 pair of latex gloves, 1 roll of painter’s masking tape, and two 10″ wooden stir sticks. Each quart order includes 1 abrasive pad, 1 pair of latex gloves, and a 10″ stir stick. Krypton’s biodegradable antifouling agent, Econea™ has cuprous oxide bottom paint’s power to defeat and shed bottom-hugging barnacles, zebra mussels, and grasses bent on destruction. But its copper-free formula does it without harming the environment. 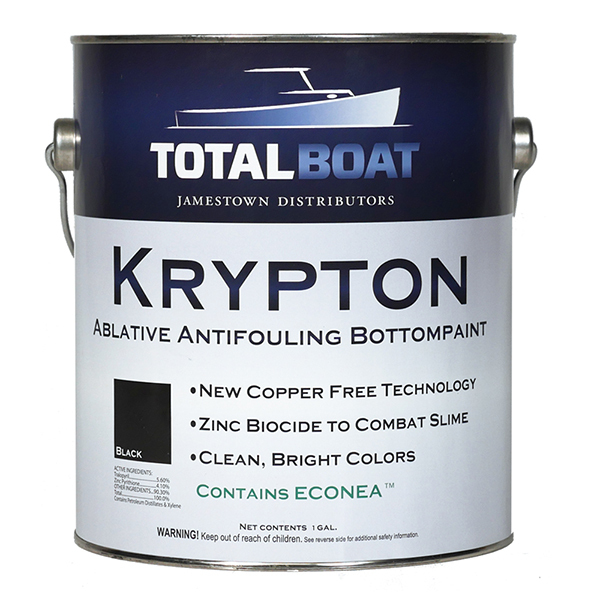 For complete fouling protection, Krypton also has a zinc biocide that effectively deters formation of algae and slime at and under your waterline. Your bottom stays cleaner, as do the waters beneath it. No foul, no harm. Because there’s no copper in Krypton, it’s great for coating aluminum hulls and underwater metals like props and outdrives, without inducing galvanic corrosion. No copper also means a Krypton bottom coating weighs less and creates less work for the engine, so you shell out less for fuel. 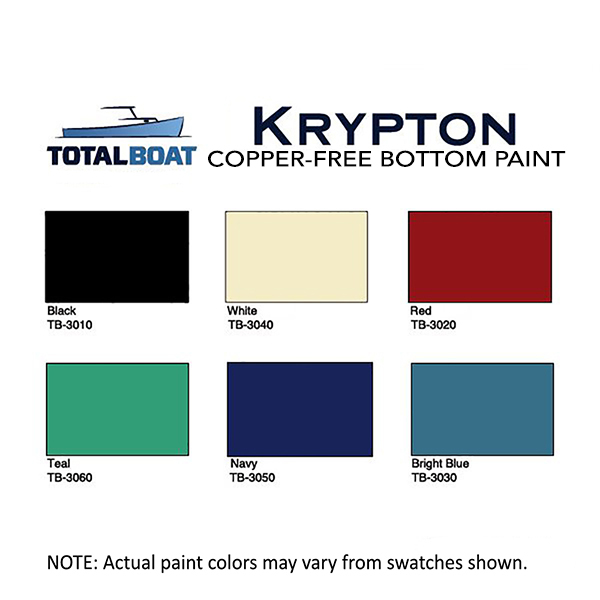 There’s even more to like about Krypton aside from great antifouling protection. Tired of flat, lifeless-looking bottom paint? Econea™ allows for the creation of cleaner, brighter, longer-lasting colors. Krypton has six to choose from, and they don’t affect how quickly it dries. Krypton is a durable, abrasion-resistant, relatively hard coating that handles trailering well. 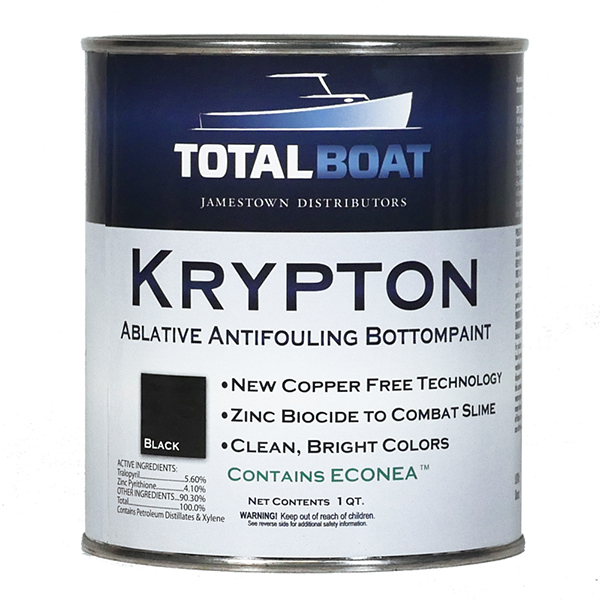 If your boat sits idle for a period of time, unlike other antifoulings, Krypton doesn’t require scuffing to reactivate the antifouling agent before splashing the boat.